Post 2/2: If you are looking for my Sparkle Creations Challenge/Preview post, please scroll down! Hello! Have you checked out all of the My Time Made Easy October releases? For the past week, the team has been showing off some wonderful projects to give you some creative inspiration. Today, we are showing our final release projects! My final projects use the Pinch Me! © template. Not only is this my final October project, but this is also my final post as a MTME designer, as I have decided to step down from the team. I want to thank Lauren for this incredible opportunity! It's been a wonderful 6 months, and I wish her and the entire team well! I know that Lauren has more fabulous coordinating products planned for future releases.. I can't wait to see them all revealed! I have two versions of this template to show you. For the first one (above), I pinched out the sides to make a little fall goodie bag. I used Sara's Traditional Dots digi paper from the Traditional Halloween paper collection. I made a simple tag (cut out with Spellbinders Labels Fourteen). I used Catherine's Thankful © stamp set. First, I stamped the acorn/leaf arrangement in Memento Desert Sand, lightly colored with some Copic markers, then I stamped Thankful over the top. I added a couple of topaz rhinestones to simply finish off the tag. For my second project, I used the same Pinch Me! template. I folded in the sides to create a bag. Isn't that great? Lauren made the template flexible so that you get two completely different looks in the same template. This is the perfect size to fit a small bag of gourmet coffee. I cut this template out of Kraft cardstock (to mimic the look of a coffee bag). The patterned paper is from Prima Fairy Flora. I used Labels Fourteen again for my tag. I stamped the window from A Lil' Cafe © and added some color with Copic markers. 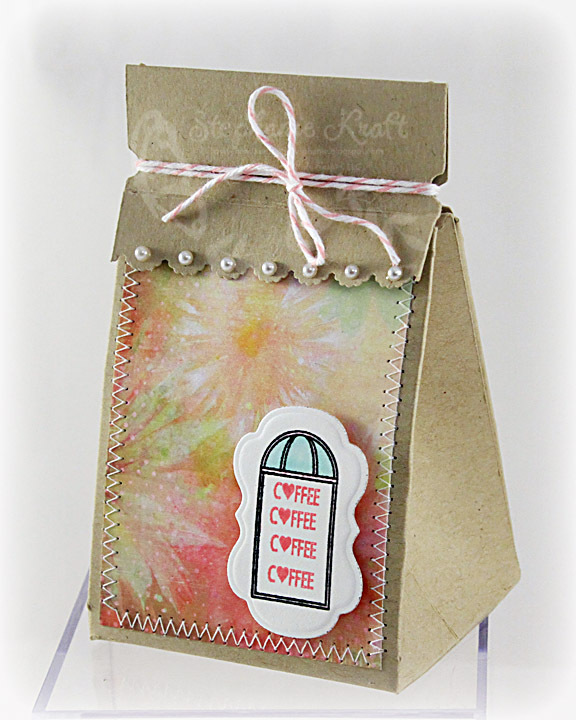 I repeatedly stamped C♥FFEE (from Grab A Cup ©). Finally, I added some white pearls along my punched border. Accessories: Pinch Me! © template (MTME), Labels Fourteen Nestabilities (Spellbinders), Markers (Copic), 3 mm Topaz rhinestones (Pizzazz Aplenty), Divine Twine (Whisker Graphics), Foam tape, Thread, Sewing machine. Accessories: Pinch Me © template (MTME), Labels Fourteen Nestabilities (Spellbinders), Scalloped Scallop border punch (EK Success), Markers (Copic), 4 mm white pearls (Pizzazz Aplenty), Divine Twine (Whisker Graphics), Foam tape, Thread, Sewing machine. Both projects are so cute Stephanie. I love the second one done in Kraft with the pretty pearls on the top!! Great job on this months release!! Stephanie~ I love the Thankful tag you created!! I will totally have to try that :0) We'll miss you...please stay in touch! These are both wonderful, Stephanie! It's been great getting to know you in this short time! You will be missed! Both of these projects are awesome Stephanie! Great way to display those templates! I am sure all of your creative hard work will be missed! What gorgeous bags!! Love them both. The papers and tag is beautiful! Stephanie - these are terrific!! I'm going to miss working with you - but totally get it :). Best wishes on all of your future endeavors. I'll still be on the lookout for your amazing creations! goodness gracious - you are SO creative - I love both of these - wish I had the time to show two versions but you did it well! You know I will miss you lots - you've been a great inspiration and a good ear. :-) ENjoy your DD and stay in touch. Beautiful projects! I am sure you will be missed. So many wonderful things you have created for the MTME!